I was provided with a free copy of The Gluten Free Instant Pot Cookbook (Revised and Expanded Edition) in order to facilitate this review. All opinions, as always, are my own. 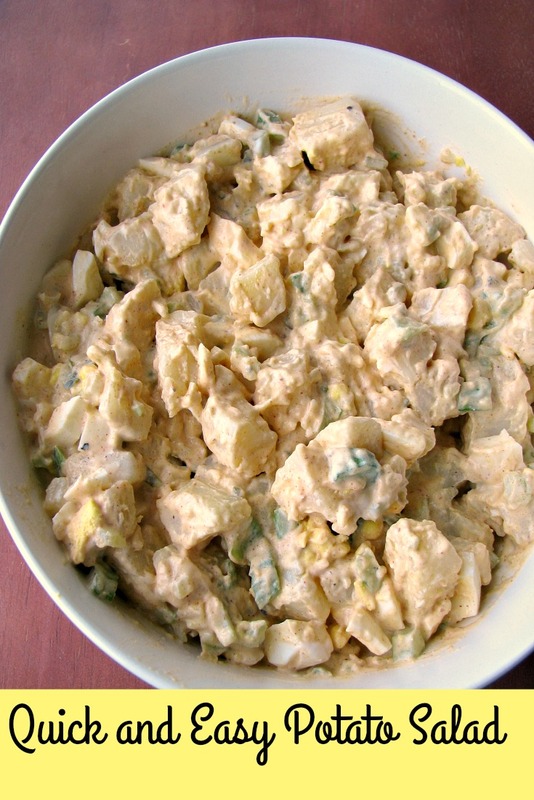 This creamy, gluten-free Instant Pot Quick and Easy Potato Salad is made with potatoes and eggs cooked together in the Instant Pot, then mixed with seasoned mayonnaise. It’s perfect for all your Summer parties! I’m excited that I got a chance to review The Gluten Free Instant Pot Cookbook by Jane Bonacci and Sara De Leeuw. Sara is one of my oldest friends I met through blogging, she owns My Imperfect Kitchen, and Jane owns The Heritage Cook. Both share great recipes with something for everyone. In The Gluten Free Instant Pot Cookbook, available here on Amazon, the first part of introduction section is all about pressure cookers, how they work, and why you should use one. The second part contains information on gluten-free cooking and ingredients. The recipes include breakfasts, appetizers, soups and stews, grains and rice, pasta, main dishes, Asian favorites, side dishes, desserts, and finally a section on stocks. Many of the recipes include tips for finding gluten free ingredients, or tips for cooking the recipe correctly. 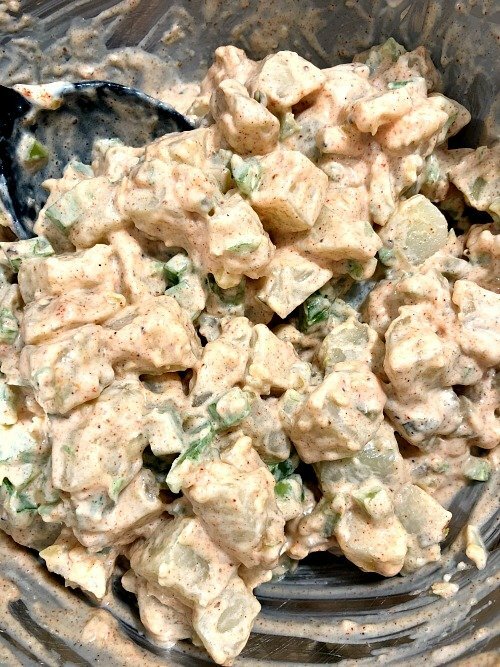 How do you make Quick and Easy Potato Salad in the Instant Pot? Add one cup of water to the inner cooking pot. Place a steamer basket over the water. If you don’t own a steamer basket, a small metal mesh colander should fit just as well. 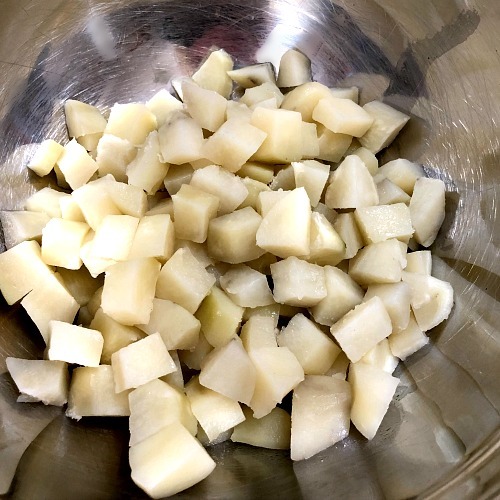 Place peeled and cubed potatoes and whole eggs in the steamer basket, nestling the eggs in with the potatoes. Close and lock the lid of the Instant Pot, making sure the steam release handling is in the sealing position. Cook on high pressure for 5 minutes. Do a quick release by carefully moving the sealing handle to venting and allowing all the steam to escape. When the float pin drops, unlock the lid and carefully open it. Remove the eggs to a bowl of ice water to cool. Remove the potatoes to a large bowl to cool slightly. Once the potatoes are cool, add mayonnaise, spices, mustard, relish and chopped celery to the bowl. Stir to combine. 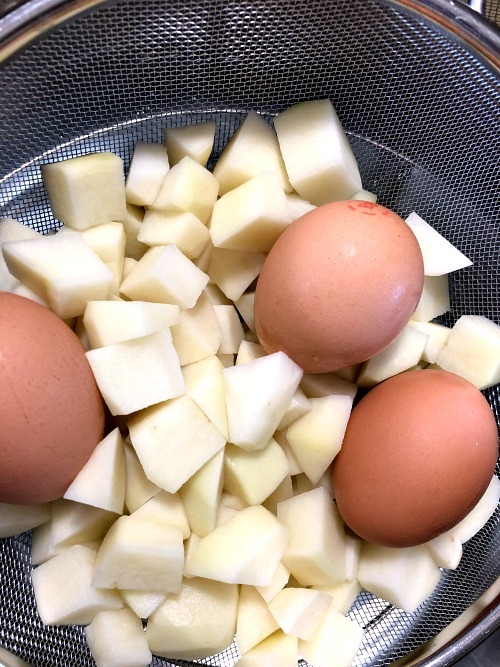 Peel the eggs, then chop them and add them to the potato mixture. Taste and adjust the seasonings, adding additional mayonnaise if desired. 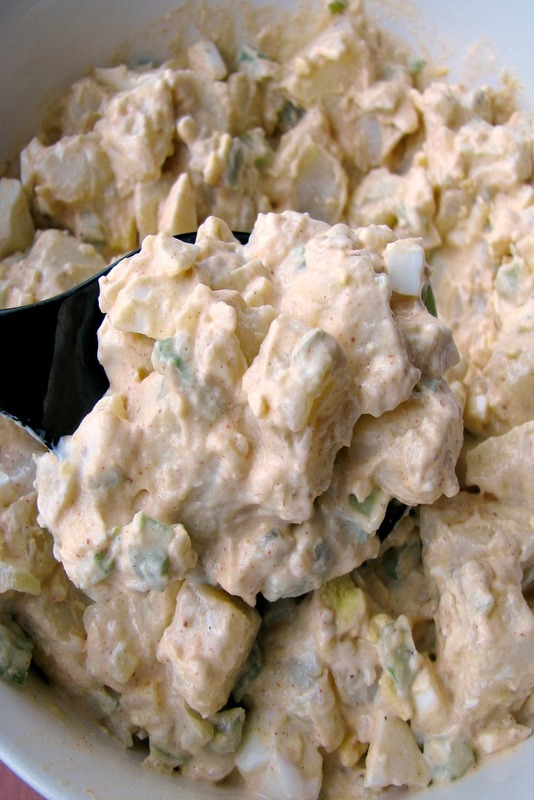 Chill the Quick and Easy Potato Salad for 1 hour before serving. 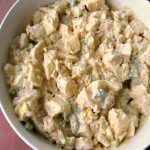 This creamy, gluten-free Instant Pot Quick and Easy Potato Salad is made with potatoes and eggs cooked together in the Instant Pot, then mixed with seasoned mayonnaise. It's perfect for all your Summer parties! Add one cup of water to the inner cooking pot. Place a steamer basket over the water. If you don’t own a steamer basket, a small metal mesh colander should fit just as well. Place peeled and cubed potatoes and whole eggs in the steamer basket, nestling the eggs in with the potatoes. Remove the eggs to a bowl of ice water to cool for 6 minutes. Remove the potatoes to a large bowl to cool slightly. This looks wonderful! Thank you so much for being part of our virtual blog tour and sharing the book and recipe!! You’re welcome! I really do love the cookbook! HUGS!! Thank you so much for trying the recipe and sharing! I’m so excited to hear you are enjoying the book. Hi Sara, congratulations! I’m so happy for your success with this book, and with everything you have been doing!